What if you didn’t plan adequately and haven’t stashed away any cash? The banks will be closed for a while. What happens? How do you pay for rent? Or food? How does your employer pay you? Do you go homeless? Or hungry? Do you get really angry, take to the streets, blame someone or something (probably the wrong thing), break stuff, set things on fire? Will Greece descend into anarchy? Of course, not everyone in Greece is hurting. Many people saw this coming and took action. They took all their money out of the banks, put it under the mattress, or maybe stored it in a safe. Maybe they bought gold, or diamonds, or something else. These people aren’t standing in lines at ATMs. They aren’t going to go homeless or hungry. But these people get a pretty bad rap—at least here in the US, where we call them “doomsday preppers.” Or “bunker monkeys.” Or “conspiracy theorists.” Or “gold bugs.” They take a beating. Jim Rickards tweeted the other day, “I’ll bet there a lot of Greeks saying, ‘I wish I had bought some gold.’” Truer words have never been spoken. Why would you do all these things but just leave your money in the bank and hope for the best? I have studied all kinds of financial crises in all parts of the world, from depressions to hyperinflations. The thing they all have in common is that people who do not prepare get crushed. People who are not appropriately paranoid get crushed. There is such a thing as being too paranoid. For a few years, I had a pretty concrete escape plan, with assets, just in case. I don’t feel sorry for Greece. I don’t feel sorry for the people in the ATM lines. They have had years to prepare for this day. Most people in similar situations don’t have so much time. I’m shocked that the banks had any deposits left at all. It’s also hard to feel badly for a nation of people who have chosen to pursue this ruinous political path—people who cast 52% of their votes for communists or neo-Nazis, and who have proven completely unable to take any responsibility for what has transpired. 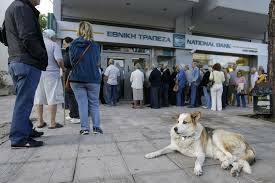 Greece will probably respond to the failure of extreme-left Syriza by electing even more extreme politicians. It seems likely that they will choose a strongman to “get things done.” I think people fail to understand how totalitarianism can happen in the 21st century. Think of this as a YouTube tutorial video on the subject. A financial crisis of similar magnitude will happen in the US someday. The only question is whether it will happen in 20 years or 50 or 100 or 200. But it is a virtual certainty. My only hope is that I won’t live long enough to see it. Still, I know how to prepare for it. I think that in the days of FDIC and various investor protections, we are lulled to sleep, believing that things really are safe when in reality, they are not. We were hours away from a complete and total financial collapse when the Reserve Primary fund broke the buck and there was a run on the money market mutual funds. We were that close.